Dear Friends—you are among the lucky few to receive what we hope will be daily communications from the sailing vessel Harmony. Our C&C 40 sailboat is part of a fleet of 150 boats headed to Cabo San Lucas starting tomorrow, October 31. The intrepid crew consists of Skipper Melody Kanschat, Barbara Morris, Avghi Constantdinides, Jeannea Jordan and Mike McGuire. Harmony is an official Women’s Sailing Association—Santa Monica Bay entry to the rally/race/flotilla called the Baja Ha Ha. We begin in San Diego and end after 11 days and 750 miles at Cabo San Lucas, Baja California, Mexico. In between there are two stops for rest, relaxation and parties. After a two-day layover (including the chance to top off fuel tanks), the fleet of about 150 boats will head to Bahia Santa Maria—another 230 miles. With no facilities, the leaders of the Baja Ha Ha import the makings of a party in the form of a rock band, taco shack and beer concession. A two-day layover ends and the shortest segment begins (about 24 hours) to Cabo. Parties and an awards ceremony cap the festivities. To say that this “race” is laid back is an understatement. Any complaints or challenges associated with the race can only be filed in a dive bar located in a sketchy neighborhood after the awards are handed out. A good time will be had by all. We attended the Halloween party for all of the crews the afternoon of 10/30. 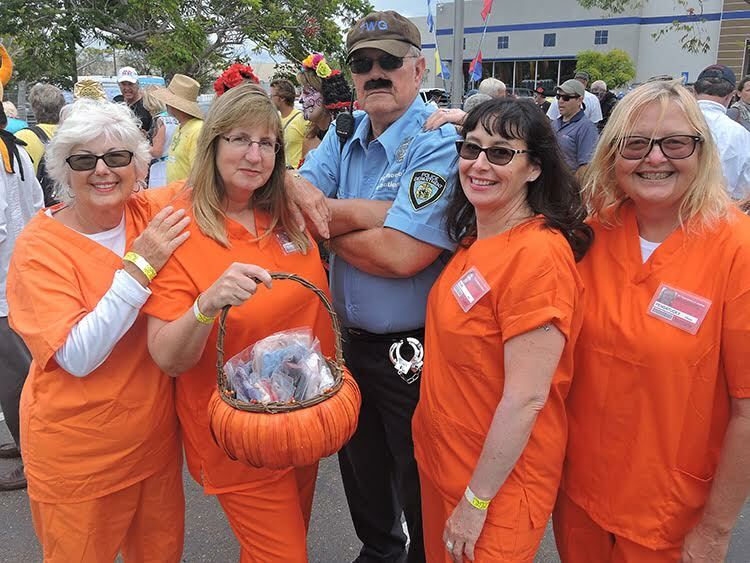 The Harmony crew won second prize in the “miscellaneous” category for our costumes based on the series Orange is the New Black. Mike was Pornstache and the rest of the crew were various inmates. Melody’s portrayal of Pensatucky with appropriate blacked out meth teeth stole the show. Left to right: Jeannea Jordan, Barbara Morris, Mike McGuire, Avghi Constantinides, Melody Kanschat.